Looking for an evaporative cooler for your home? 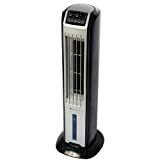 Review swamp coolers on sale and pick up an air cooling unit for your home today. 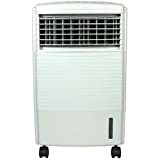 Swamp coolers, also known as evaporative coolers, offer a highly effective, low cost air conditioning alternative which can actually work better than AC units in certain climates, at a significantly lower operating cost as well. They're not only cheaper to begin with, but they also use far less electricity to run properly, so it could be just what you're looking for. Check out if evaporative coolers are the right option for you and pick one up today, and relax in the newfound luxury of a comfortable home, perfectly acclimatized to your personal specifications. Because a swamp cooler is simply a fan that circulates hot, dry air over a source of cold water, all it needs to operate is a source of electricity, and some water, two things that tend to be extremely cheap. Compare this to the heating and cooling process of Freon, a chemical substance found in "real" air conditioning units which are more energy-intensive to operate. All this adds up to swamp coolers operating at about 1/4 of the cost as real air conditioners, on top of the fact that the initial cost is much lower as well. So in the climates where these units are intended to be used, they're not only the better way to go, but cheaper too. 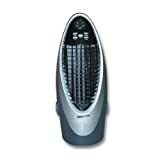 Should I get a swamp cooler or an air conditioner? Swamp coolers are better in dry climates. Because they circulate hot air over a container of water, they humidify the room, and can often be operated as a humidifier alone. They need a steady stream of dry air, which they will cool down by adding moisture to the air. In arid regions, this can be important for keeping the air comfortable, rather than just holding at a specific temperature. Air conditioners are better in humid regions, as they will dehumidify the air as they operate. This is preferable in humid climates, as the moisture reduction will provide a further cooling effect by allowing perspiration to operate as nature intended. They do need an outlet to vent hot air, as well as the condensed water, which generally means they require higher installation costs. Click to view more options and buy online! Although you'll find plenty of options at Amazon through the listings above, eBay is also a great bet for finding cheap swamp coolers, and anything else, really. Often companies selling through eBay offer free shipping as well, so you can find deals through the many sellers that might work better for you than other options. The selection may not be as diverse, though the prices are sometimes better. All you have to do is shop around to find a cheap one and save. If all you need is a tiny little machine, perhaps for a small office or bedroom, you can actually find some handheld units, which seem to be a fan favorite among their many satisfied clients. Smaller units are easier to place in a room, so they can be situated exactly where they need to be to spray a nice, pleasant, cooling mist right at you. If it's placed like this, it can be even more effective than a powerful unit placed further away. Check out these tiny, portable, handheld evaporative cooling fans from Handy, and collect them all in each of your favorite colors! Click to buy online from Amazon! If you find yourself in a humid climate, then a swamp cooler is not going to work as well as you might like. In fact, it could make things even worse. Humidity can damage homes, and prevent perspiration from cooling the body, potentially making things even more uncomfortable. Swamp coolers are intended for dry climates, but if you're suffering in humid heat, you need a real air conditioner. Remember that installation is somewhat more complex for a "real" air conditioner, but, of course, if you live in the sort of environment that needs one, then it's the only way to go. 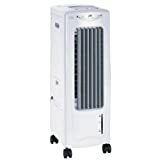 Click the link below to find some cheap portable air conditioners to keep you cool and comfortable at home. Hot climates and stuffy homes can always use some air conditioning, so find a cheap portable air conditioner to cool your home. Window air conditioners can be an efficient, convenient, and cost effective way to keep a home comfortable. Here are my selections for the best window air conditioners available.